In case you haven't noticed, it's AR Week on Wareable. We've been talking all things augmented reality from what's happening now to the more exciting prospect of what's on the way in the future. Much like VR, AR looks set to find its way into a host of different industries. Whether it's military training, keeping us fit, fuelling the creativity of the next generation of designers or even in education. It's going to be huge and from the many companies we've spoken to that's investing in AR, this really is the next big computing platform. One area we haven't explored just yet is the world of sport. A place that is often used as a testbed for tech innovation. Health monitoring devices are being embraced by athletes, virtual reality is bringing us closer to the action, so what does AR have in store for us? 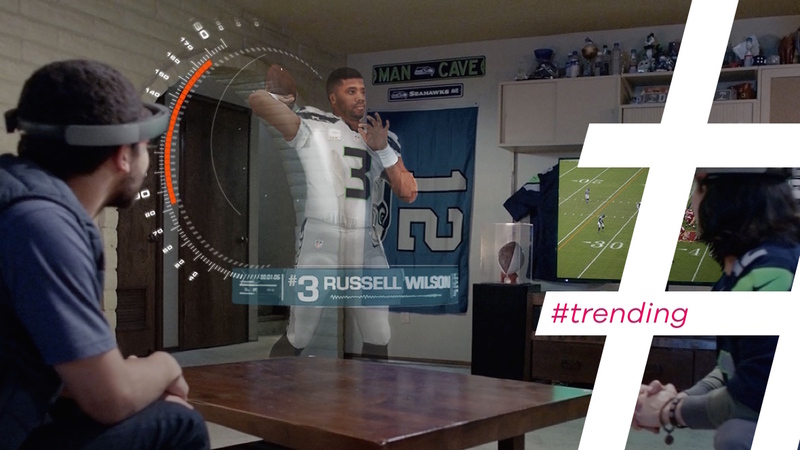 Here's what's happening now and what's next for augmented reality and sport. It's a bit of a mixed bag for AR and sport so far with early examples largely focused around enhancing watching the action at home and getting more from your visit to the stadium sans AR eyewear. Both in the US and the UK, phone-based AR has meant supporters have been able to do things like scan club logos, match programmes or match tickets at the venue to unlock things like behind the scenes video and player interviews. From a broadcasting point of view, we're seeing more graphics overlaid onto action during the game. The NBA and the NFL are among those that have taken advantage of AR tech to do things like show the yellow first down during football games or the three-point arc if a shot is attempted in range. It all started with the glowing puck in NHL broadcasts back in the 90s, but things have come on leaps and bounds since then. So what about AR headsets? Right now, it's VR time to filter into the training and analysis realms for athletes, but there's huge potential for AR to do something similar if not do more. This is something that Chris Kluwe discussed in his Ted Talk exploring how augmented reality will change sports and build empathy. If you can look beyond the fact he's wearing Google Glass, Kluwe makes some exciting predictions of what could be possible by building AR tech into footballer's helmet visors. The consumer version of HoloLens is still missing in action, but developers have now had time to dabble with what the headset is capable of. That includes showing how it could benefit coaches and managers to work on systems and tactics. VAR Football's app lets users run through different plays on the football field from different angles and collaborate with team members and coaches to talk through changes. What about going to the game? One for the corporate hospitality crew, Panasonic demonstrated its Window AR projection setup at CES in January this year that aims to make your viewing experience more immersive. The transparent film that can be attached to a windowpane could enhance the viewing experience by showing off player stats and video footage overlaid onto the action. What about watching from home? Microsoft also wants to improve that viewing experience and the video above could paints a picture of what watching the game from your living room could one day look like. This teaser of a future Super Bowl viewing suggests Microsoft's headset will let you pull up match stats, check in on your fantasy league player performance and changing camera angles. Make it happen Microsoft. It's big business, especially in the US. According to the Fantasy Sports Trade Association, over 56 million people in the US and Canada play in some form and AR is going to become a piece of the puzzle. Startup AR Sports recently unveiled its prototype AR Fantasy Sports software that can be built into sites bringing aspects like player acquisitions and completing those rosters into the augmented reality realms. Fancy playing some AR sport? That's right. AR could well breed new sports. Take Hado, an augmented reality game created by Japanese startup Meleap that uses a head-mounted display, a phone and motion sensors letting you run around shooting fireballs at each other. Don't be surprised if we start seeing more of these 'next-gen' sports appear once AR tech becomes more readily available. If you think e-sports was big, this could be bigger. So there's still a way to go then? Yes there is, but the signs that AR is going to be adopted in the same way that VR has by the sporting world are positive. Whether it's watching from home, going to the game, improving player performance or creating new sports, AR is definitely going to be part of the future of sport.